Stay Frosty Enterprises, LLC provides these brave individuals and out of the military and paramilitary service with clothing and gifts worthy of those that served. Stay Frosty holds official licensing of the United States Navy, USMC, USAF, USCG and Popeye the Sailor. Some of Stay Frosty products include, T-Shirts, Challenge Coins and custom products. In quarter 1 of 2016 Stay Frosty notice a sudden and unexpected drop in sales. Upon research it was discovered that many companies had stolen Stay Frosty’s IP ( For example lifting images and selling T-shirts). 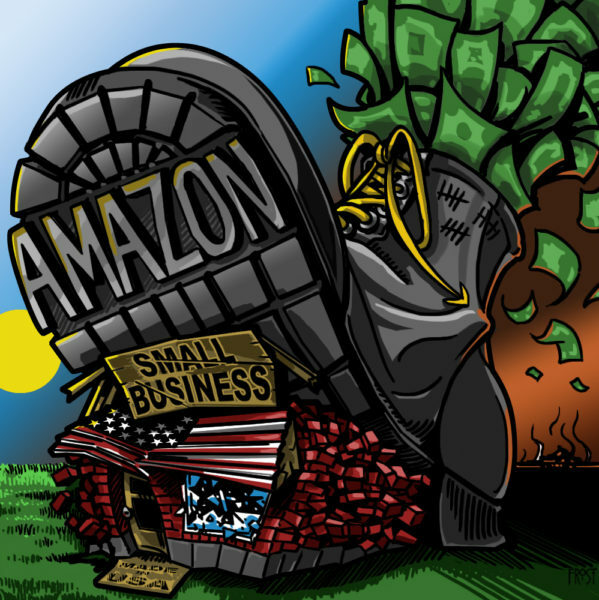 The perpetrators included both small and large companies including Amazon. Stay Frosty Enterprises Vs Amazon et al. A copyright suit filed by small innovative veteran owned Stay Frosty Enterprises, LLC online store Vision-Strike-Wear.com. Identifying over 100 federally copyrighted and over 300 in other copyrighted intellectual properties infringements by 12 parties including Sunfrog, Teespring and Amazon! Soon after filing suit, fearing further penalty, Amazon immediately has taken down Stay Frosty property including designs we had not identified. Clearly they knew which ones were our designs. While Sunfrog and Teespring continue to sell Stay Frosty’s Federally Copyrighted designs after being served the lawsuit! We have screenshots of every offender’s website pages displaying our products on their sites. Retail are those that are selling our designs on-line by SKU, while Custom is when an individual customer requests a single job from to be completed for a one time fee. In addition we have communication from many promising to stop selling and take down but are still selling. The Fashion Law – Amazon An Antitrust lawsuit Waiting to Happen? Since this suit has been filed an additional 15 infringers with more federal and non-federally copyright properties have been identified. We have attempted to contact all directly to cease and desist. Q1 of 2018 Stay Frosty Enterprises, LLC, a small veteran owned and operated business serving the US military located in Portland, OR, filed suit against Amazon.com, Inc. in Seattle Washington; Teespring.com in San Francisco, CA; Sunfrog, LLC in Gaylord, MI; Kidder Corp in Canton, CT; Viralstyle LLC of Tampa, FL; US DOD Coins LLC in Apopka, FL; Coastal Advertising in St. Mary’s, GA; Milcoins.com LLC in Milford, CT; Empire Designs and Insignia in Brooklyn, NY; Veteran Apparel LLC in Ainger, NV, and Spreadshirt Inc. in Boston, MA for federally registered copyright infringement from their online store, Vision-Strike-Wear.com with over 100 federally copyrighted and over 300 in copyrighted intellectual properties. How could this be? Vision-Strike-Wear.com had been serving the military since 2008, creating over 1500 custom art and shirt design requests from actual military units going on deployment or coming home during the height of Operation Iraqi Freedom and Operation Enduring Freedom. Before Stay Frosty Enterprises the company was Vision-Strike-Wear.com and only created military graphics for custom requests from active duty troops in the Army, Navy, Air Force, Marines and Coast Guard. In 2014 Vision-Strike-Wear.com decided to test the waters of the online retail market. By the fall of 2015, made up of two operating partners and a handful of American made and owned vendors, Stay Frosty Enterprises, LLC was formed. The future looked very bright for this small veteran-owned and operated company who was bringing new and amazing military designs to those who deserve only the best! That is, until later that year the carpet was pulled out from underneath them when “big business” swooped in with huge marketing budgets and dominating online presence, thwarting any attempt for a small business to participate in a fair marketplace. Sunfrog’s SKU infringement list and our losses year after year. Also shows repeat theft year after year after we released new designs. They love Vision-Strike-Wear.com’s military t-shirt designs! So much that for the following 2 years Stay Frosty would be spending precious limited man hours that could have gone to building their own company to track down anyone selling their designs and why sales plummeted. Luckily, many active duty customers would let Stay Frosty know when they came across someone trying to use their designs for custom shirts and challenge coins, which got them on the trail of what would become the largest rabbit hole they had ever fallen into. Stay Frosty wishes to thank all those honest US Veterans out there that helped them locate all the companies profiting from their properties. Dedicated to the troops, Stay Frosty Enterprises took the high road and reached out to many veteran operated sites to agree upon reconciliation for any trespass. Some recognize the infringement and immediately agreed to a fair reconciliation. Some did not. Some agreed to cooperate yet have not made any action to stop selling infringed designs. Many promises have not been kept. Many of these infringers, even after being served, continue to sell Stay Frosty Enterprises intellectual property and graphic designs. Unfortunately, realizing how large and significant the impact was would not be clear until the fall of 2017, after discovering both Amazon and Teespring were selling hundreds of Vision-Strike-Wear.com designs and had been for years. Amazon displays when they began selling them, which according to their site was September of 2015 weeks after Stay Frosty released these new copyrighted designs on Vision-Strike-Wear.com and weeks before Q4 the largest consumer spending period of the year! Now, Stay Frosty Enterprises struggles to compete against itself, against the Goliaths of the industry, and has diversified into retail challenge coins to stay afloat. Stay Frosty Enterprises’ place in the online military shirt market has practically disappeared. This case is unprecedented. This lawsuit will be the “stone” that slays these giants and allows a small innovative AMERICAN-MADE business to compete in the unprincipled and unethical desert of today’s online retail industry. Legal and court costs are high and we can barely make ends meet much less stop these bullies from taking our hard earned future from us. Funds will help our business stay afloat and finance the legal suit. We appreciate all your help and support overcoming this monumental threat!